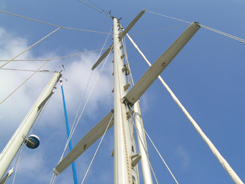 Whilst almost “maintenance free” from season to season, stainless steel wire gradually work-hardens through the repetitive stresses aboard a yacht, becoming brittle and with its tensile strength much reduced. Surveyors and insurance companies generally agree that stainless steel standing rigging wire should be replaced every ten to twelve years. TS Rigging can re-rig vessels of every size, from dinghies to super-yachts. We can travel to your boat, but have also had great success with “re-rigs-by-post”; owners remove and send us their rigging, well labelled, and we then replace and return it to them, usually within 72 hours. TS Rigging holds the more common gauges and configurations (1x19, 7x7, 7x19) of marine grade stainless steel wire in stock, together with typical end fittings. We can also source more exotic wire types and sizes and end fittings quickly and economically. 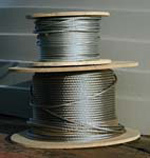 19 strands of individual wire used mainly on fibreglass yachts with a well-tensioned rig. We can supply the following swage fittings in a range of sizes: swage eye, swage stud, swage fork (machined or welded), toggle fork, Hasselfors T terminal, Universal T terminal, mushroom/ball terminal, toggle and swage stud, and open or closed rigging-screws. Hard eye and soft eye talurit splices. 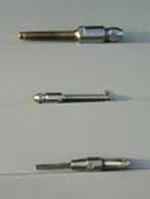 We carry a wide variety of Stalok Fittings - please contact us for details.